Do you want to turn your life around? Are you tired of that nagging feeling that your life has reached a dead end and nothing is changing? Maybe there is an area in your life that needs a total overhaul, for example, your career or relationships? You may be struggling with self-esteem, anxiety issues or need some help breaking bad habits? Perhaps you are dealing with pain, phobia or a lack of confidence? A Breakthrough Session can help you. Sometimes in the effort to make things better for ourselves, we try to make changes, to ourselves, to people close to us, our goals, to surroundings and substitute in alternatives in an attempt to make things better. The trouble is that we are the same person on the inside, so whatever we try and do to alter things or wherever we run to, we invariably take our problems with us. So, at worst, you won’t achieve your hopes and dreams and at best, it will take you much, much longer than it should. A Breakthrough Session can speed things up significantly for you and facilitate your transition, releasing emotions that have held you back and enabling you to feel positive, motivated and empowered to move forward. You can take quantum leaps in your thinking, create a great sense of purpose & move on with a renewed sense of congruence, confidence and empowerment. How do I know all this, because I have done it myself and experienced so many wonderful transitions when working with my clients. Change might be scary to some people, however, breakthrough sessions can bring about positive changes, because they are all for your greater good. We all have loyalties and fears and many of us worry about change or moving on. But with change can come excitement, enjoyment, anticipation and often hope. It does however, mean making some tough choices and even the possibility of unpopular decisions. Just imagine being able to make those changes in your life that may possibly have been draining your energy for a long time. It could be overcoming anxiety or a lack of confidence in yourself and your abilities or perhaps eliminating stress or some bad habits you have developed. You can change your personal performance in all areas, changing your perspective, developing new strategies for a clearer, calmer approach and start to find enjoyment in your relationships in your personal and professional life. You will experience a revitalised energy and focus, opening up new opportunities and exciting possibilities. A breakthrough session negates the need to wait to have a series of sessions, so with today’s busy lifestyles and heavy workloads, it only requires one day out for you to let go of those unwanted emotions and behaviours. How does a breakthrough session work? I make use of the most powerful personal development mind technologies including Neuro-Linguistic Programming (NLP), Time Based Techniques (TBT) and hypnosis. 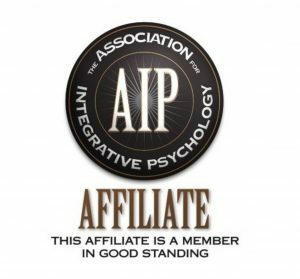 Certified by The Asociation for Integrative Psychology. These techniques allow direct contact with the part of the mind that stores our emotions, memories and habits – the unconscious mind. Clients enter the session being aware of their conscious values and beliefs about themselves, but here I dig deeper, working on deeply unconscious values which drive your thinking and behaviour. By aligning your conscious and unconscious thought patterns, I am able to begin to work towards your goal. The sessions are very personalised, and the nature and length can vary. Typically, a breakthrough session is approximately 4-8 hours, working one to one. After an initial phone call to discuss what you want from the session, we start the process with a set of questions designed to root out your thoughts and feelings, providing the underlying issues, as well as those that are surfacing. When a comprehensive overview of the issues has been compiled, we start to eliminate them, whilst always providing the mind with new resources and new perspectives; you gain clarity and enjoy ‘aha’ moments! New strategies and achievable goals for the future are added to your tool-kit, together with the means to control future negative emotions and rebuff them. Armed with the new, empowering beliefs about yourself, you will have the opportunity to think back to your old habits and points of view, casting them off, knowing that you can achieve your highest aspirations. These sessions can be undertaken face to face, via Zoom or Skype Video. There are a few breaks and it is quite intense. It can be tiring, so don’t have much planned for the next day. However, the changes are phenomenal! A follow-up session is included in the price which is normally scheduled for a month after the breakthrough session, subsequent sessions are subject to further charges. I cannot make the change for you. But, I can be your Breakthrough Coach! How much is that worth to you?